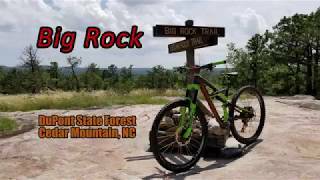 Big Rock trail is a 'must do' trail for the serious mountain biker. Going up is an aerobic challenge and coming down gets pretty technical in places so this is not a beginner friendly trail. KEEP OFF THE MOSS ON THE SLICKROCK!!! It is easily damaged and takes years to recover. The trail is a mostly steep singletrack over a variety of surfaces ranging from hard pack dirt to loose stones to slick rock. Though only .84 miles in length, this trail will make you work to get to the top. Once there you have only three options for the decent. Big Rock Trail will get you closer to the Corn Mill Shoals Access Area parking lot. Or take either leg of Cedar Rock Trail: the right leg is more technical but shorter than the left leg. Once at the top you'll find great views of the surrounding area. The top of Cedar Rock has 'balds' - large expanses of slick rock. Please stay off the plants since most of them are easily damaged and very slow to recover. The rocky surface of the balds makes placing trail markers difficult so you'll see several cairns or rock piles marking the trail here. Try not to knock them over and feel free to rebuild them if you come upon one that someone else disturbed. Love the slickrock bits. It's a challenge without being unmanageable for intermediate riders willing to walk a few short sections. View from atop Big Rock trail. At the top of Big rock trail, Dupont. Best view in Dupont State Forest. Intersection of Big Rock and Cedar Rock trails.